Here's to it staying uneventful on the injury front. Saw a few video loops the other day of OL vs DL in some 1 on 1. OL looked pretty doggone nasty.....very quick, good skills, looked good to me. Barring injuries now or in the fall, this group seems likely to be sharp come show time. Hey mr43 thanks for the info. where were these videos and can we look at them ? "May be best scrimmage he's seen in a long time..both sides looked strong. Few penalties; none on defense." Encouraging! I attended the Letterman's reunion and scrimmage today with several members and few lurkers of our board. Thought we looked pretty sharp overall. Passing is still our bugaboo but all in all I thought we looked pretty good, considering we had tons of kids out many of whom will start. The QBs all looked pretty good: Jacks is best runner, Butler read it well (made some guys miss) and threw it ok, and Goodson looked really good throwing it. OL looked pretty good. Corners played pretty well; safeties got beat deep on a few. Lots of young ones playing. Who stood out to me: McAfee, Hill, Gouger, Hinton, Lemon, Vining, Young and Green. Stoddard had a real nice spin move and run for TD after being stoned on initial try on last play. I sense the coaches are relatively pleased. It was a nice day to see some guys you haven't seen in a while. Had lunch with a few of our black shirts and let me tell you it was a treat to meet these guys. They are such good kids: polite, articulate, smart, funny, fun (2 are pre-med, 1 is double majoring and wants to go to law school and one is a business major). These kids are the real deal. I am just so proud of our players and coaches and the way our program is run. We often (myself included) get caught up in a ton of things that at the end of the day pale in comparison to what really matters. 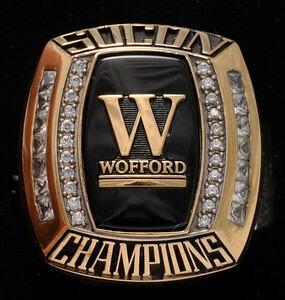 As a father of a WoCo freshman and alum, I am just really really proud of who and what we are as a school and program. JRIS is a month ahead of schedule BTW. Thanks Ruckus for a good and well thought report. cannot wait for the coming season. Did Devin Watson play much and at what position ? and JoJo Tillery ? I think Watson and Tillery along with Lemon and Green are going to have a good year. Watson (and Lemon) started at CB. Tillery at S (with Green). http://player.tout.com/goupstate/ypsfy5 It looks like our receiving corps is strong. Thanks for the heartfelt summary, Ruck. Let me start by saying I greatly underestimated what we have as a WR corps! This group now has a great mix of size, speed, and ability to get open. Hill made some nice catches and has some big play ability. Cleary made some nice catches in traffic and it was nice seeing a big body WR on the perimeter. Helligar did not play but this group along with RJ and Moates in the mix could be a difference maker for us contending for the SoCon championship. The next group that looked impressive was the DL. I loved seeing coach Riase sending out units of players in droves and there seemed to be no drop off. Don't think I saw Roach or Vaughn but this group is deep. Next our OL was consistent and like Ruckus said very few offsides or holding calls. This unit in the redzone gets it done. The LB corp was the most depleted of any group. Most were on the sidelines recovering from off season surgeries. I was impressed with Lyles, and could see him making an impact and getting significant snaps this season. The secondary has made some glaring adjustments. Don't know if my mind was playing tricks on me, but gone are the 7, 8. and 10 yard cushions. Our CB's (Armfield, Lemon, Watson, Williams) can turn and run, and look to be more physical in setting the edge. They were in the WR hip pockets majority of the time. The safeties struggled a little with blown coverages, but the unit was aggressive in run support. Again the Safety group was beat up as well, with players like Ward and Higbie out, the lack of game knowledge and in game adjustments was evident. The QB situation was what we all expected. Evan is the most athletic, Butler is the best dual threat, and Goodson is the best game manager. All in all... my impression is optimistic barring injuries. If we can improve on our special teams and the return game we could be a 10+ win team. Cant wait till next scrimmage to see a few more players thrown in the mix from the injury front. Last edited by WocoSix on Sun Mar 13, 2016 3:09 pm, edited 1 time in total. Thanks for the great details WC6. Cleary was highly regarded in HS and should be a valuable asset; versatile. http://player.tout.com/goupstate/hgq8jh Assuming the LBs get past nicks and bruises, it seems to me that unit will be strong and deep as well. Morris is a key. First, I certainly enjoyed seeing Wofford football again! Will be a great last rodeo for us. Unfortunately WoCo6 you're eyes were deceiving you a bit in regards to the corners. They still played almost exclusively zone yesterday, so the cushions were still there, except in the red zone, which has always been the case. We probably won't see much different until every one is fully healthy, including the safeties. Let's not forget Cole Higbie was a good starter before he got hurt, and Nick Ward is a very solid starter as well. We need all of them plus the appropriate healthy lb's before we see different coverages. Armfield's also had a minor injury that hasn't allowed him to be out there as much so the young corners, mainly Lemon, and Watson have gotten a lot of great reps, but simplified coverages, so cushions still prevail. Williams has also been in and out, and they're counting on him. They've done a great job, it will allow them to do some things with the entire secondary, depending on who can do what. They know what the seniors Green and Armfield can do, they're trying to figure out the rest. Having so many guys recovering from injury unfortunately hasn't allowed them to see who they will truly be come fall. They're a different defense with all of those guys healthy. I also think Tillery will compete for a spot as well. What I saw yesterday from the offense is what I expected to see. Jacks is the best runner, Goodson can really throw, and Butler is the dual threat. It is an interesting scenario to see what they do with them in certain games. Especially since this group of receivers is the best I've seen since we've been here. However we are really strong at rb too. Glad to see Stoddard coming on. They'll obviously be able to run the ball, how much they can mix it up will be the million dollar question. The scrimmage was a hard evaluation, with so many guys out or limited. Some of the young guys definitely showed they can play when called upon. It will make for a very deep team for a change. Normally once you get past our starters, there has tended to be a drop off, not with this group. Unfortunately next week's scrimmage won't show much either, because some of the older guys will be limited so as not to get hurt on the last day of full contact. It will be a great opportunity to continue to see the young guys however. Looking forward to the last day of football for awhile. TnTerrier2 you are probably correct. More than often they were zoning up WR's but I dont recall seeing 10 yard seperations. The 2 big plays the secondary gave up were communication errors. Which happens alot when playing zone coverage.I think that since our DL and LB groups are so talented and deep...it will give our secondary chances to make plays. One thing I wish we did do, was to incorporate a nickel / dime package. The 4 CB's and at least to of the safeties on yesterday look like they have the ability to cover in open space.